I'm trying to get self sizing UICollectionViewCells working with Auto Layout, but I can't seem to get the cells to size themselves to the content. I'm having trouble understanding how the cell's size is updated from the contents of what's inside the cell's contentView. Custom UICollectionViewCell with a UITextView in its contentView. Scrolling for the UITextView is disabled. The contentView's horizontal constraint is: "H:|[_textView(320)]", i.e. the UITextView is pinned to the left of the cell with an explicit width of 320. The contentView's vertical constraint is: "V:|-0-[_textView]", i.e. the UITextView pinned to the top of the cell. The UITextView has a height constraint set to a constant which the UITextView reports will fit the text. I put the project that I've been playing with on GitHub here. In iOS 10+ this is a very simple 2 step process. Im curious, how would wrapping your cells contents in a UIView make Auto Layout perform better? Id have thought it would perform better with a more shallow hierarchy? I did not mention performance, only simplicity. Self-sizing cells will only work if you have constraints spanning all the way between left and right, and between top and bottom. Achieving that is easiest when all views are wrapped in a single container. If that container is a UIStackView it is easier that if it is any other descendant of UIView. Can you please tell me how to set height constant (like set height 25, and width will be automatically changed) for UICollectionViewFlowLayoutAutomaticSize. Using Swift 4.1, Xcode tells me UICollectionViewFlowLayout.automaticSize has been renamed to UICollectionViewFlowLayoutAutomaticSize. Where do you set this? in viewdidload? How do you get a handle on flowlayout? A few key changes to Daniel Galasko's answer fixed all my problems. Unfortunately, I don't have enough reputation to comment directly (yet). To configure the appearance of your cell, add the views needed to present the data item’s content as subviews to the view in the contentView property. Do not directly add subviews to the cell itself. Then skip step 3 entirely. It isn't needed. iOS 9, Xcode 7. Cells are protoyped in storyboard, set custom subclass. Tried creating a property called contentView, Xcode complains it conflicts with existing property. Tried adding subviews to self.contentView and set constraints to that, then app crashes. @NicolasMiari I don't know about how to do this programmatically, my solution is really just to add a single uiview in the XIB where everything goes inside it. You don't need to create a property or anything. I'm not sure what the confusion is. I believe that @NicolasMiari wasn't following my instructions properly. You don't need a property "contentView". You don't need to "add subviews to self.contentView". In your prototyped cells, make sure everything is inside a single UIView. That's it. When you drag a view into the cell in IB, top level, you are effectively adding a subview to the cell's contentView, right? No. You aren't adding a subview to the contentView. I believe you are actually creating the contentView itself with the view I'm saying to add. Based on what i'm seeing here adding the views directly to the cell in storyboard are adding it to the content view. I printed the contents of cell.contentView, cell.contentView.subviews, and cell.subviews and without having added a "parent view" to the cell, cell.subviews just has the contentView, and the contentView contains all of the subviews i added in storyboard. @ProblemSlover I'm confused. Doesn't the cell itself have a contentView? Should we be adding it to that? Why do we need an extra view? After seeing my GitHub solution break under iOS 9 I finally got the time to investigate the issue fully. I have now updated the repo to include several examples of different configurations for self sizing cells. My conclusion is that self sizing cells are great in theory but messy in practice. A word of caution when proceeding with self sizing cells. Self sizing cells are only supported with flow layout so make sure thats what you are using. There are two things you need to setup for self sizing cells to work. Flow layout will become dynamic in nature once you set the estimatedItemSize property. This comes in 2 flavours; Auto-Layout or custom override of preferredLayoutAttributesFittingAttributes. I won't go to in to detail about this as there's a brilliant SO post about configuring constraints for a cell. Just be wary that Xcode 6 broke a bunch of stuff with iOS 7 so, if you support iOS 7, you will need to do stuff like ensure the autoresizingMask is set on the cell's contentView and that the contentView's bounds is set as the cell's bounds when the cell is loaded (i.e. awakeFromNib). Things you do need to be aware of is that your cell needs to be more seriously constrained than a Table View Cell. For instance, if you want your width to be dynamic then your cell needs a height constraint. Likewise, if you want the height to be dynamic then you will need a width constraint to your cell. //Exhibit A - We need to cache our calculation to prevent a crash. NOTE On iOS 9 the behaviour changed a bit that could cause crashes on your implementation if you are not careful (See more here). When you implement preferredLayoutAttributesFittingAttributes you need to ensure that you only change the frame of your layout attributes once. If you don't do this the layout will call your implementation indefinitely and eventually crash. One solution is to cache the calculated size in your cell and invalidate this anytime you reuse the cell or change its content as I have done with the isHeightCalculated property. At this point you should have 'functioning' dynamic cells in your collectionView. I haven't yet found the out-of-the box solution sufficient during my tests so feel free to comment if you have. It still feels like UITableView wins the battle for dynamic sizing IMHO. Be very mindful that if you are using prototype cells to calculate the estimatedItemSize - this will break if your XIB uses size classes. The reason for this is that when you load your cell from a XIB its size class will be configured with Undefined. This will only be broken on iOS 8 and up since on iOS 7 the size class will be loaded based on the device (iPad = Regular-Any, iPhone = Compact-Any). You can either set the estimatedItemSize without loading the XIB, or you can load the cell from the XIB, add it to the collectionView (this will set the traitCollection), perform the layout, and then remove it from the superview. Alternatively you could also make your cell override the traitCollection getter and return the appropriate traits. It's up to you. I'm trying to implement the same thing with flow layout, however when I return it newFrame with updated size, the layout doesn't seem to recalculate y positions, which are still based on the height in estimatedSize. What's missing? @anna are you calling invalidateLayout on the layout? At which point should I be calling invalidate layout? @anna my apologies I thought you were changing your layout and the view was not updating. Is your - (UICollectionViewLayoutAttributes *)preferredLayoutAttributesFittingAttributes:(UICollectionVi‌​ewLayoutAttributes *)layoutAttributes being called? yes, it's being called and retuning the correct height for each cell but the contentSize of the flow layout never adjusts to accommodate the new heights. Where are you setting the estimated size property on the collection view layout? Yep, setting it on the layout. I've seen other comments in Apple forums where people had that problem. But not sure if it's a bug or you have a way to do it if it's working for you? Correct, brand new project. Sure, if you want to put up a sample on GitHub or something, would be great! Ah, found the difference, you set the estimated height pretty high (400) whereas I was doing the minimum (44). That helped. But the contentSize still seems to not be getting set correctly until you scroll all that way through, so still not very usable. Btw, I changed UITextView to UILabel, same behaviour. Yeah, thanks for helping to solve part of the mystery! But I don't think the flow layout is ready enough to use in production. Probably will stick with the old methods a while longer.. I have also tried for many hours to get dynamic sized cells in a flow layout to work and they work about 90% of the time. But some of the time cells are missing or in the wrong place, and if you scroll around the collection view sometimes the missing cells will appear or disappear. A lot of the time the missing cells are at the end of the view. Changing the estimatedSize makes a huge difference in how things work and how fast the view reloads, contrary to the doc, which implies it's just an optimization. My conclusion is that it's just too flakey to be useful beyond the most simple examples. I've tried everything in this answer (and beyond) but still couldn't make it to work. @DanielGalasko I'm looking, but my collection view usually needs to look like table view, and as you've mentioned, it doesn't work right out of box for scenario. @DanielGalasko I'll let you know if I find a solution. I have a customcollectionview cell and this [self.contentView systemLayoutSizeFittingSize:(UILayoutFittingCompressedSize)]‌​.height is returning zero always. I am doing all the steps that has been suggested. I was just testing UICollectionView with dynamic type and autosizing cells is enabler for such type of functionality. Unfortunately it doesn't work correctly. Layout changes after cells are visible. This is also visible in demo provided. When data source provides more strings that are longer, result is completely broken. This is a correct answer how it should be done, but unfortunately UICollectionFlow layout autosizing is broken and can not be used in production :( This doesn't work correctly yet even on iOS9 beta5. Pity. @JurajAntas are you invalidating your layout? I haven't had any issues. Perhaps ask a new question? This appears to be fundamentally broken on iOS 9 GM. Setting estimatedItemSize leads to crashes -- there seems to be some huge bug in how auto layout is trying to process the UICollectionViewCell. Running into a similar issue, has anybody found a work around? your solution as others say does not work always. Try changing the constraints of a cell after selection and deselection for ex. The whole collection breaks again. The Auto sizing is broken on ios9! I will revert back to use itemSize delegate and do the calculations myself. @DanielGalasko Check out my answer below. I wasn't originally able to comment against your answer but mine is a lot simpler, I recommend editing yours. Thanks for the post! I tried it, but ran into problems with a simple example. I think we might need to set contentView.translatesAutoresizingMaskToConstraints = false. @Senseful I am so close to turning this post into a Wiki. It's really tough to maintain because it's so buggy and difficult to get working! I find that simply implementing a "preferredLayoutAttributesFittingAttributes" in my custom UICollectionViewCell that simply returns the layout parameter fixes sizing issues on reused cells. This effectively disables the default version of the function, if I include a call to the super version, again the sizing fails. Is there is any way that the cells can take up empty spaces between them just like game of tetris, if they have different height and width among them? Hi, this works well if my collectionView is static, but if I add some cells (and it won't fit on the screen), the last cells are displayed only when I scroll. If I invalidate the flow's layout in the viewWillLayoutSubviews, it works well on ios10, but infinite loop on ios9, if I invalidate the layout after I reload the collectionView, it works well on ios10, but breaks on ios9 after adding a few cells, any idea? Is preferredLayoutAttributesFittingAttributes more performant than Auto-Layout? Ive tried an Auto Layout grid list before wiht varying item sizes and the performance was awful. Hoping to give your preferredLayoutAttributesFittingAttributes suggestion a try tomorrow and see what the results are. shouldn't we call super preferredLayoutAttributesFitting first? Also, set an UIView as mainContainer for your cell and add all required views inside it. @IBOutlet private var mTitle: UILabel! @IBOutlet private var mDescription: UILabel! @IBOutlet private var mContentView: UIView! @IBOutlet private var mTitleTopConstraint: NSLayoutConstraint! @IBOutlet private var mDesciptionBottomConstraint: NSLayoutConstraint! /*now here's where you want to add all the heights up of your views. and that's it. Returning the cell's size in collectionView(:layout:sizeForItemAt:) in this way preventing me from having to use estimatedItemSize, and inserting and deleting cells works perfectly. I had that nasty crash if estimatedItemSize was set. Even if I returned 0 in numberOfItemsInSection. Therefore, the cells themselves and their auto-layout were not the cause of the crash... 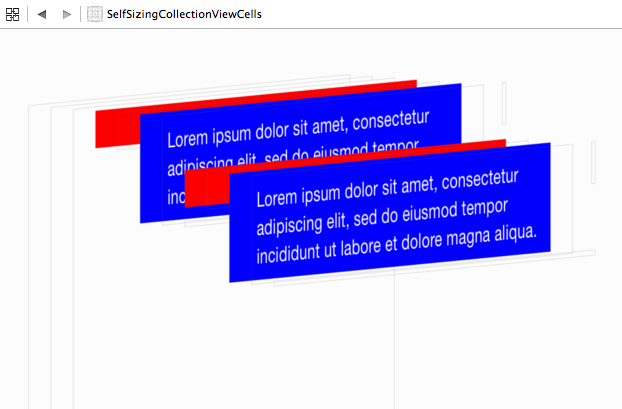 The collectionView just crashed, even when empty, just because estimatedItemSize was set for self-sizing. In my case I reorganized my project, from a controller containing a collectionView to a collectionViewController, and it worked. 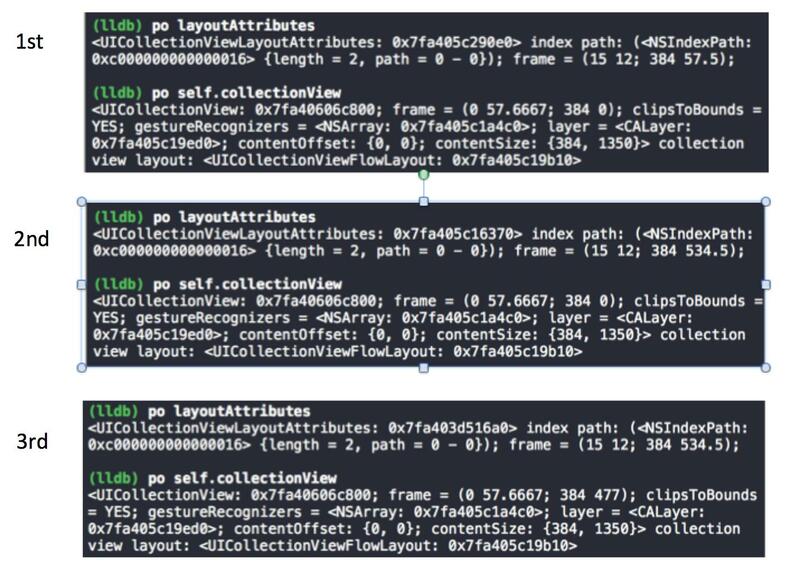 Try calling collectionView.collectionViewLayout.invalidateLayout() after collectionView.reloadData(). Second, in iOS8.x version, flowLayout.estimatedItemSize will cause different section inset setting did not work. i.e. function: (UIEdgeInsets)collectionView:layout:insetForSectionAtIndex:. When you call collectionview performBatchUpdates:completion:, the size height will use sizeForItemAtIndexPath instead of preferredLayoutAttributesFittingAttributes. The rendering process of performBatchUpdates:completion will go through the method preferredLayoutAttributesFittingAttributes but it ignores your changes. I've seen this misbehavior, but only when the estimated size is zero. Are you sure you're setting an estimated size? I did a dynamic cell height of collection view. Here is git hub repo. And, dig out why preferredLayoutAttributesFittingAttributes is called more than once. Actually, it will be called at least 3 times. The layoutAttributes.frame.size.height is current status 57.5. The cell frame height changed to 534.5 as our expected. But, the collection view still zero height. You can see the collection view height was changed from 0 to 477. 2. Validated self-sizing cell again after other cells recalculated. will cause system call infinite loop and App crash. Any size changed, it will validate all cells' preferredLayoutAttributesFittingAttributes again and again until every cells' positions (i.e frames) are no more change. when I try to scroll, the collection view cell is not smooth. Do you have any solution for this ?.